The inspiration for this post came at me from several different directions. A few weeks ago, Jenn who lives in South California, told me about a teriyaki bowl she had at a restaurant. She said it had asparagus, broccoli, and other vegetables in it, but she suspected the sauce was loaded with sugar. She asked if there a way I could come up with a healthy version. I looked up recipes for teriyaki sauce and discovered they called for honey or brown sugar, which isn’t as bad as white sugar – but it’s still sugar. 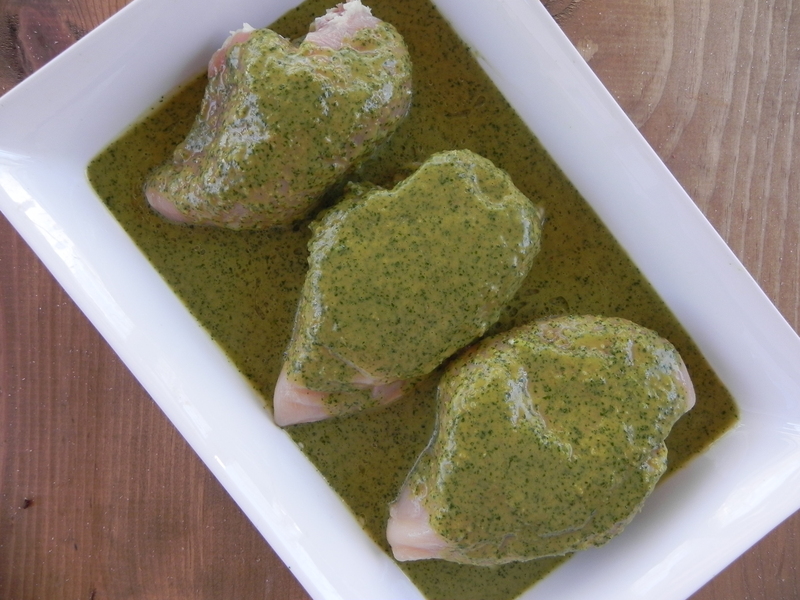 I remembered this great marinade from a fund raiser cookbook that I have used and loved in the past. 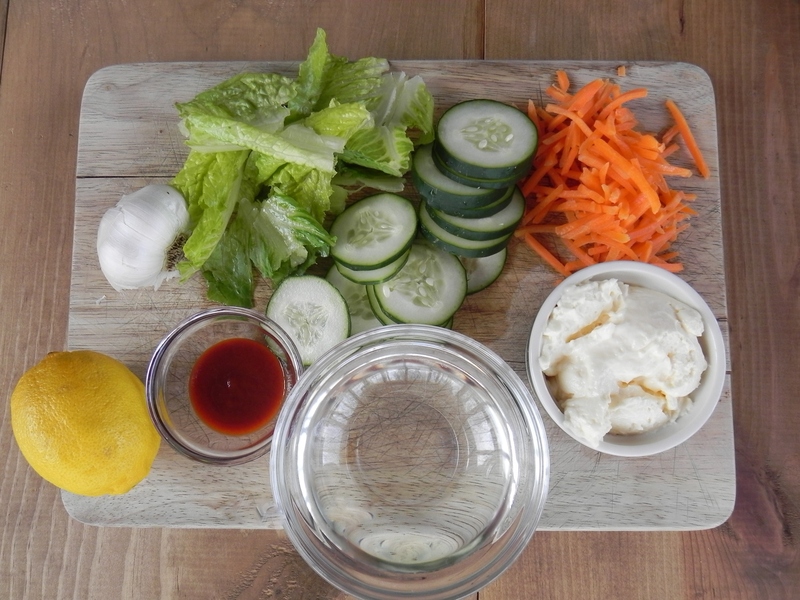 In fact, I sometimes use the marinade as a salad dressing which my girls and their friends love. 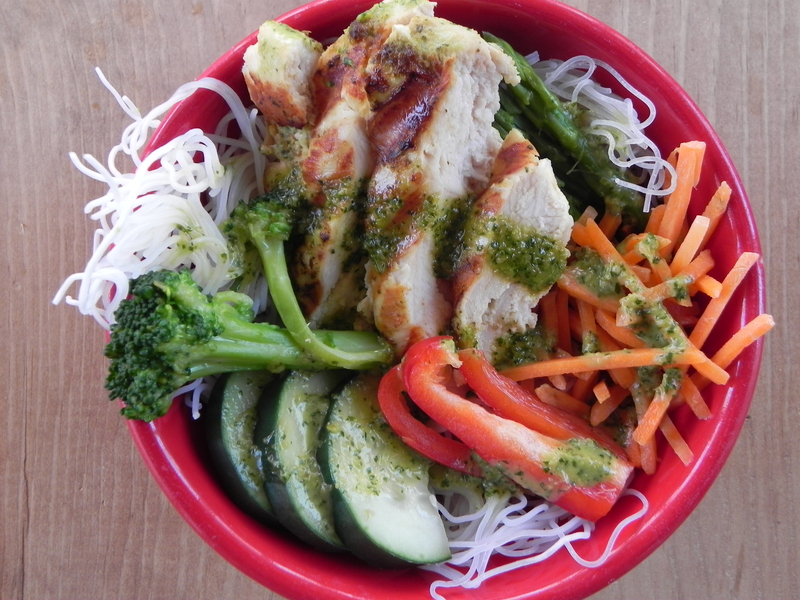 I used it here with chicken in a vegetable and rice noodle bowl. 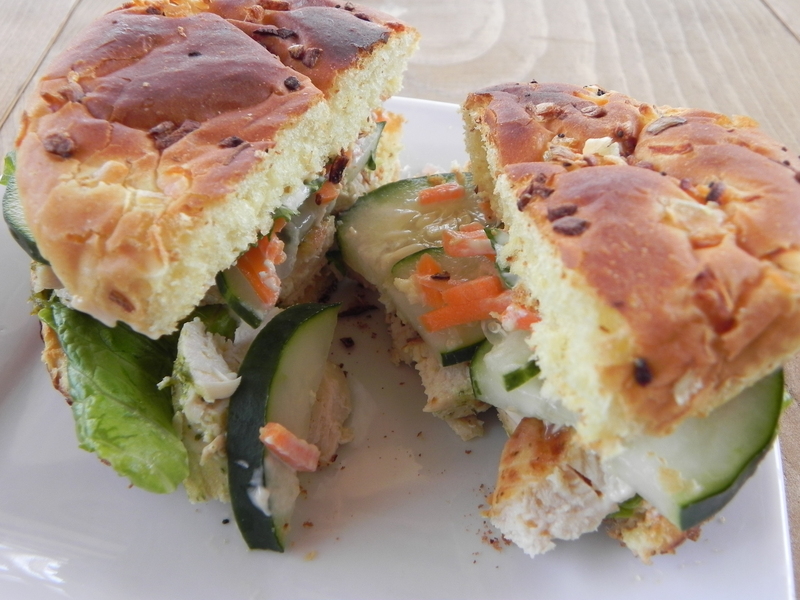 The chicken and vegetables were so great together, I started thinking of banh mi sandwiches. I was introduced to them by a friend who was born in Vietnam, so she really knew what she was doing when she made them! They are fabulous sandwiches, but I rarely get a chance to indulge in one here in the midwest. 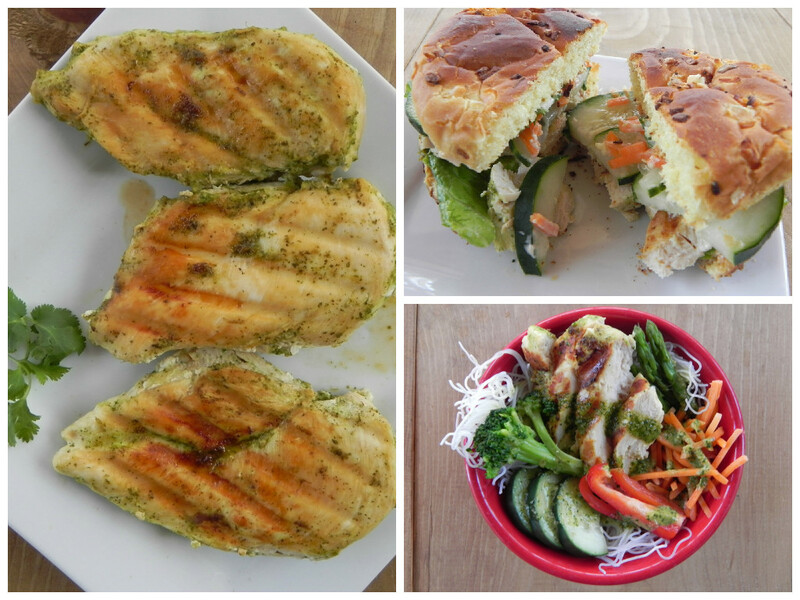 I used the cilantro lime marinaded chicken to create the bahn mi like sandwich posted here. At any rate, since there is no sugar in the marinade and lots of vegetables in these recipes, I feel like I can enjoy them guilt free! 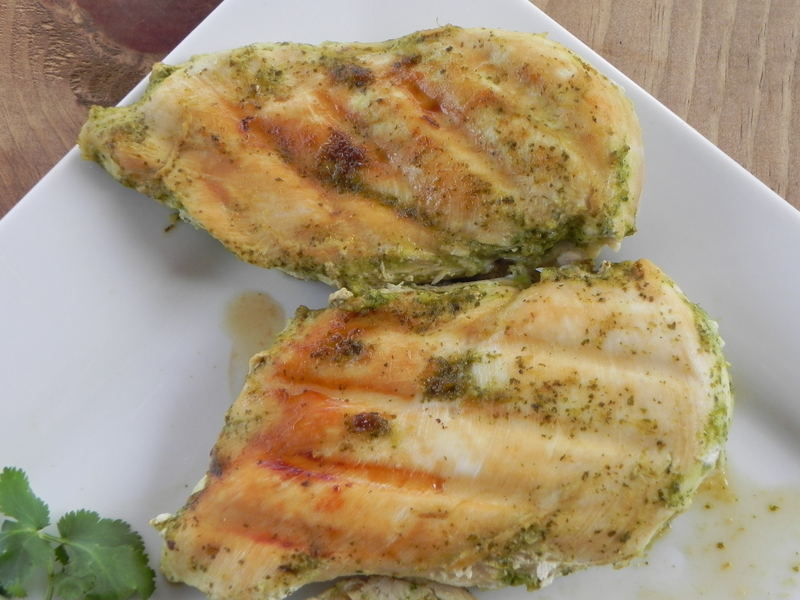 Rinse and pat the chicken breasts dry with paper towels. Place in a shallow pan or in a large ziploc bag and set aside. 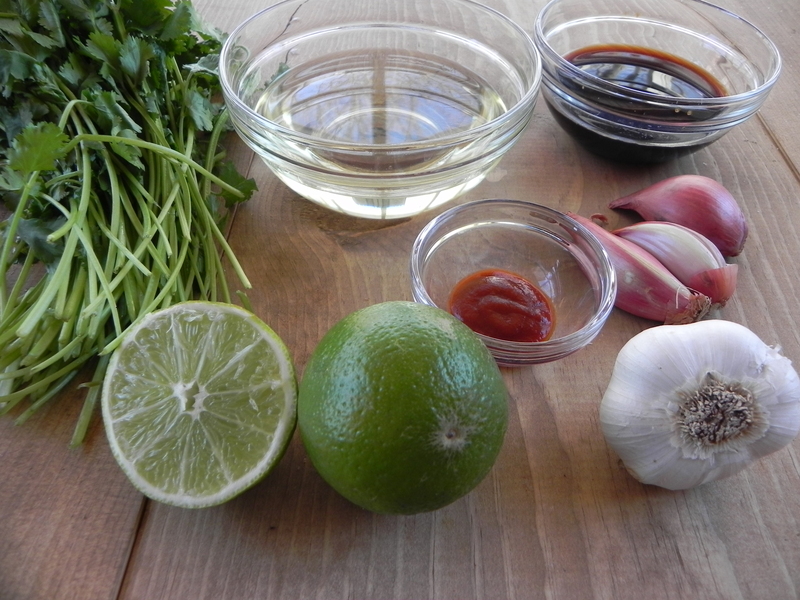 Roughly chop the cilantro and place in a blender or food processor along with the oil, soy sauce, shallots, garlic, lime juice, and hot sauce. Blend until smooth. If desired, reserve about 3/4 of the sauce for later use as a salad dressing or sauce for sandwich or noodle bowl. Pour the remaining sauce over the chicken in the pan or the zip lock bag. Refrigerate for 4 hours or keep out at room temperature no longer than 20 minutes. Remove the chicken from the marinade. Cook the chicken by grilling over medium heat about 6 minutes per side or baking for 50 minutes at 350 degrees. I used a George Foreman grill on the ones shown here. It took 8 minutes until the juices ran clear and when I cut into one of the breasts, it was no longer pink in the middle. 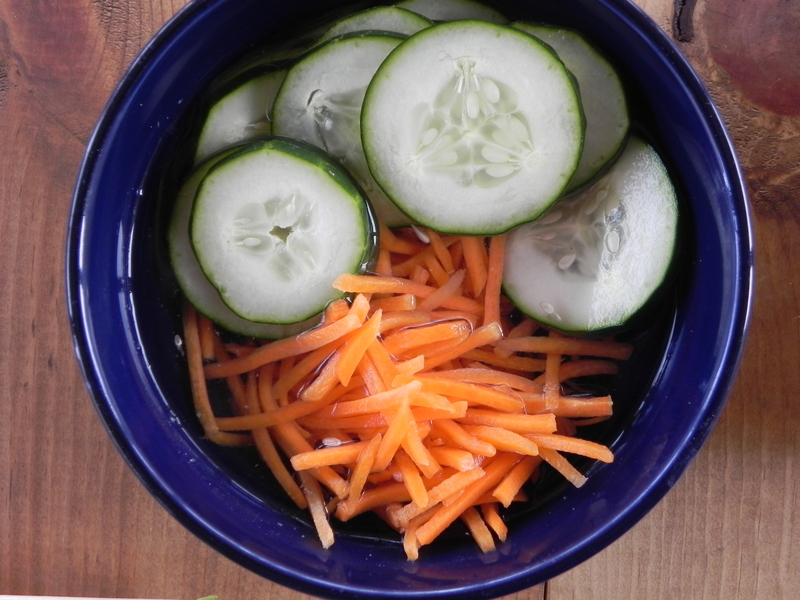 Place the carrots and cucumbers in a bowl. Combine the vinegar with the salt and pour the mixture over the carrots and cucumbers. Let them sit out at room temperature for about 10 minutes while assembling the sandwich. 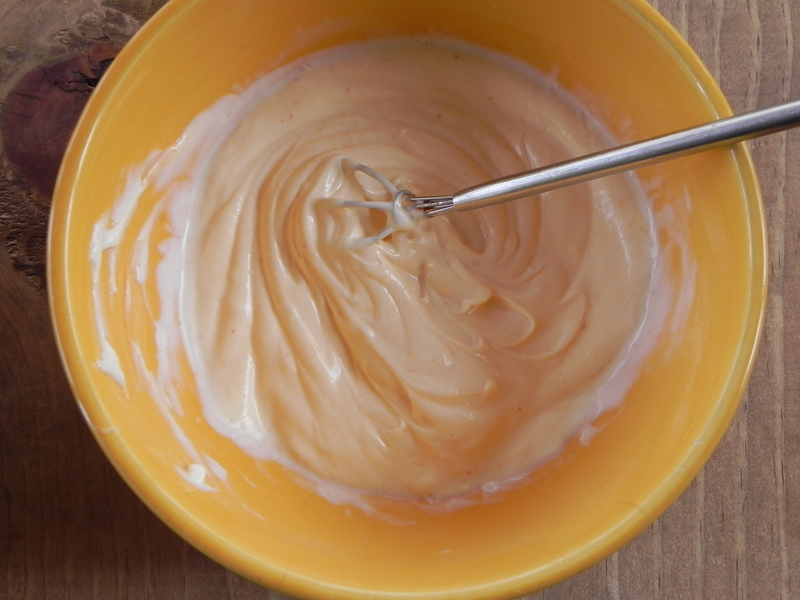 Mix the mayonnaise, garlic, Sriracha, lemon juice and salt together. This is also delicious if a couple tablespoons of the reserved cilantro lime marinade is added to it. 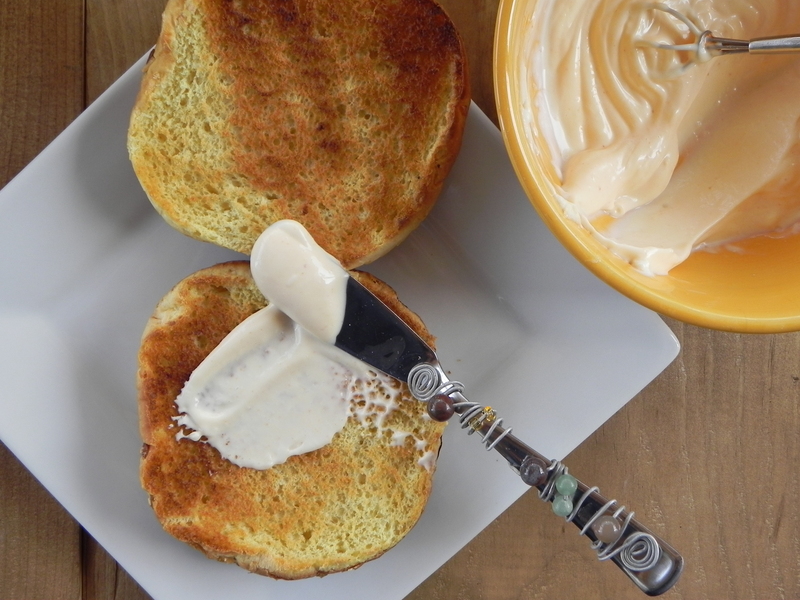 Toast the bun, and spread the mayonnaise mixture on both sides. 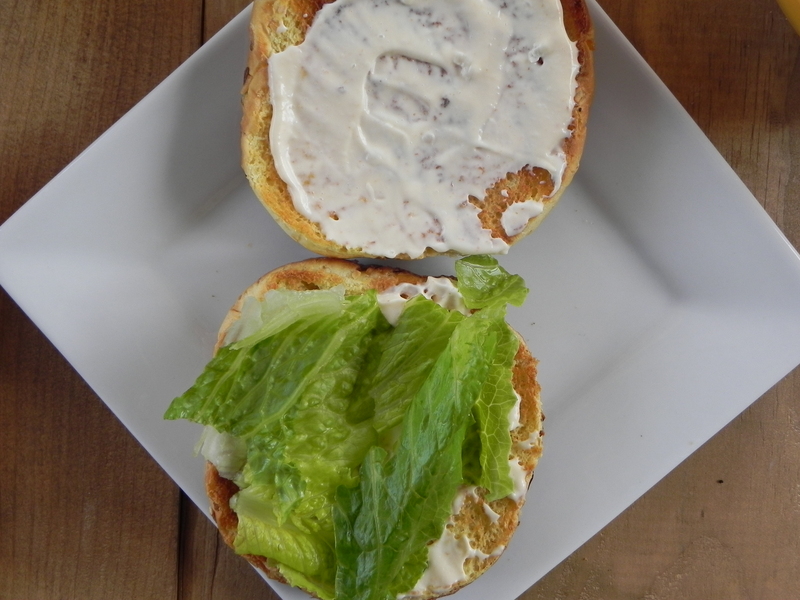 Place some of the lettuce leaves on top of the bottom bun. Cut the chicken breasts into slices and load them on top of the lettuce. Remove the cucumbers and carrots from the vinegar mixture. Place about 2 tablespoons of the carrots on each sandwich. 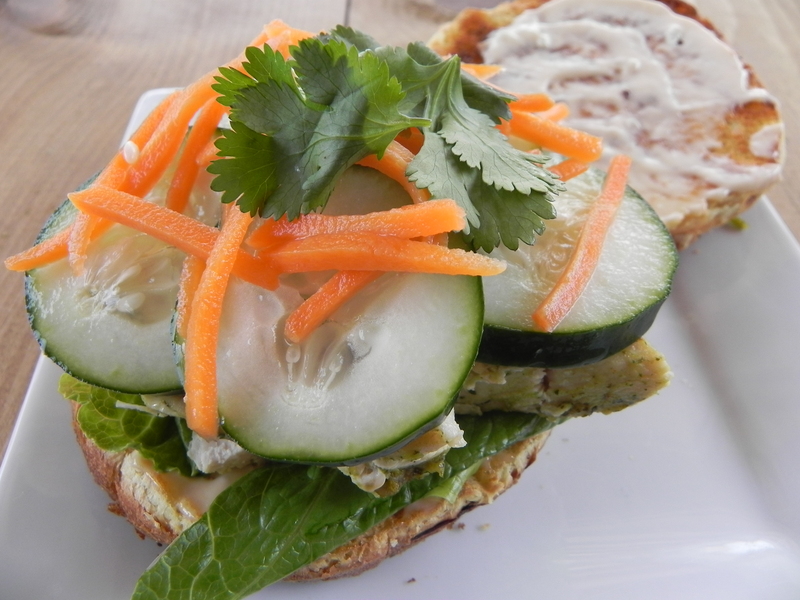 Divide the cucumber slices among the sandwiches. 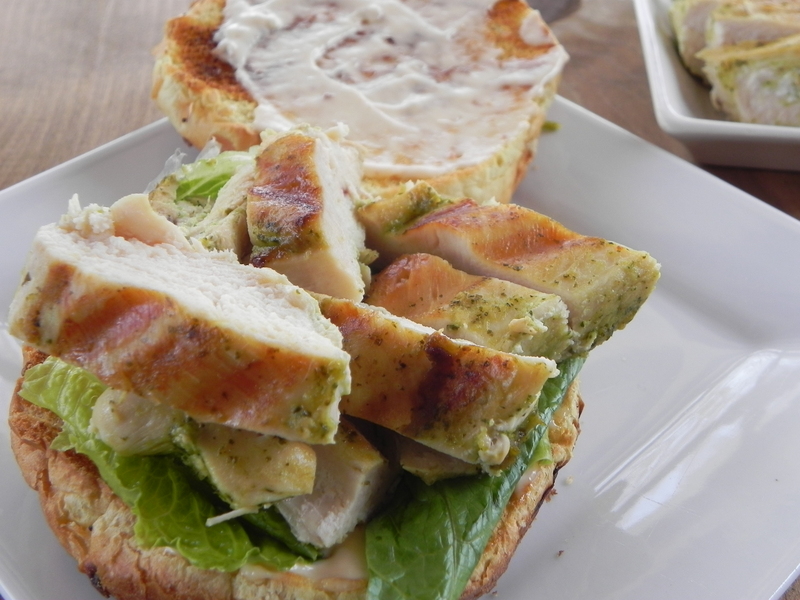 Top each sandwich with a tablespoon of cilantro leaves. Place the bun on top and enjoy! Plunge the asparagus and broccoli into boiling water for two minutes, then remove and place them in a bowl of ice water to stop the cooking. Place about 1 cup of cooked rice noodles into each bowl. 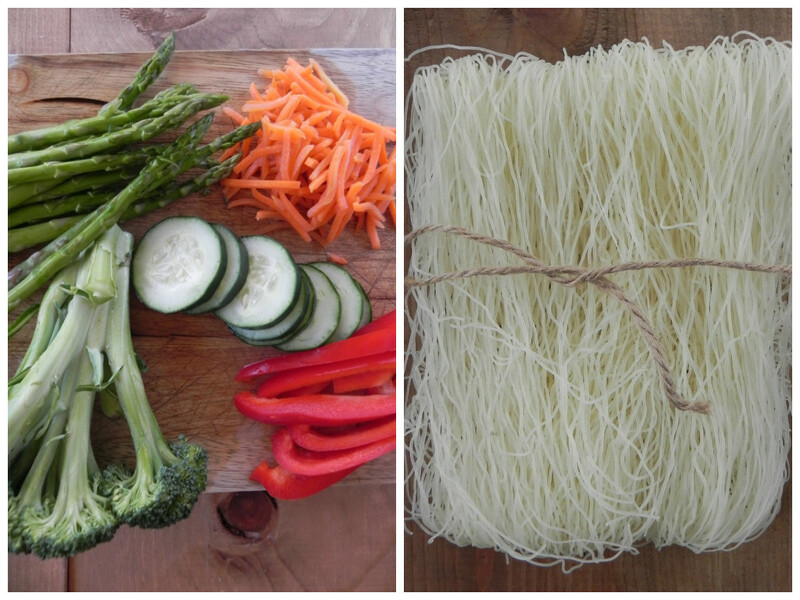 Divide and arrange the chicken and vegetables on top of the noodles. Drizzle each bowl with the reserved cilantro lime marinade.